Atlas and the Anchor: Ryan Adams & The Cardinals - "Cardinolology"
Ryan Adams & The Cardinals - "Cardinolology"
The ever prolific Ryan Adams has released his tenth album overall and fourth full length with The Cardinals as his backing band. 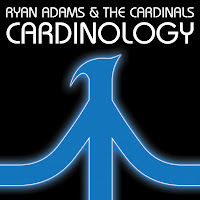 "Cardinology" is the most cohesive and complete set of songs Ryan has done with The Cardinals. Many of the songs are written in the same Grateful Dead-like alt country vein, though Ryan still indulges in some U2-like arena rock, like on "Magick" and "Cobwebs", the latter features his best Bono wail. Most of the polished production that gave last year's "Easy Tiger" an adult alternative feel are replaced with more twang and rougher edges, sounding closer to his work with Whiskeytown than any of his solo albums. Everything seems to work on this new record. Fans of the 70's rock of "Gold", the dirtier side of "Rock N' Roll" and the rambling twang of "Jacksonville City Nights" will be pleased as "Cardinology" delivers on all facets of Ryan Adam's songwriting strengths as a whole. "Fix It" sounds like it was chosen by the label as the lead single as it's more in line with the mellow mood of "Easy Tiger". The next track on the album, "Magick" is the most straight-forward rock song on the album with distorted guitars, pounding drums and an anthemic chorus. "Natural Ghost" is true to its title with unearthly steel guitar and background vocals. And "Born Into A Light" is steeped in the vintage harmonies of The Band. Critically, Ryan Adams is one of the more polarizing artists in rock but in "Cardinology", he and The Cardinals have an undeniably great record and one of the best of the year. It's A Musical - "The Music Makes Me Sick"
These Arms Are Snakes - "Tail Swallower And Dove"
Portugal. The Man - "Censored Colors"
The Little Ones - "Morning Tide"